The tech world is reeling from revelations gadget blog Gizmodo obtained an early Apple test unit of what may be the next-generation iPhone . It's not clear if the leaked iPhone is truly the iPhone 4G expected to launch later this year or a prototype still in development. Nevertheless, how could this happen to Apple? - a company known to keep secrets better than CIA, in some cases. It's been a dramatic few days as the story has unfolded, but now a clear picture has emerged showing how the device was lost, who lost it, and how Gizmodo obtained it. So here's a look back at what happened, and how Apple, a company notorious for its secrecy , lost a test unit of the so-called iPhone 4G. March 18, 2010: Apple engineer Gray Powell makes a nighttime visit to The Gourment Haus Stadt, a German Specialty Shop and Beer Garden in Redwood City, California, according to Gizmodo . Powell was carrying with him an iPhone prototype--purportedly the next-generation iPhone device--made to look like an iPhone 3GS. At the Haus Stadt, about a 24-minute drive from Apple's headquarters, Powell had a few drinks, updated his Facebook status using the supposed iPhone 4G and left the establishment. March 18, 2010-March 19, 2010: Unbeknownst to Powell, he left behind his iPhone test unit at the beer garden in Redwood City, where it was eventually picked up by an anonymous stranger. The stranger believed he had found a regular iPhone 3GS, and after playing with it for a while opened the Facebook application that suggested Powell as the owner of the device. The anonymous stranger waited for Powell to return and claim the device, but Powell never returned. March 19, 2010: The next morning, the anonymous stranger, aware that Powell was the owner of the phone, tried turning on what he still believed to be an iPhone 3GS. But the phone had already been bricked by remote wipe, rendering the device inoperable. After careful examination of the device, the stranger realized it was not a normal iPhone. Eventually, he was able to remove the iPhone's phony 3GS exterior, and discovered the iPhone prototype inside. March 19, 2010, cont'd: Aware he had made a significant discovery, Gizmodo says the stranger attempted to contact Apple with the intention of returning the device, but was ignored by Apple representatives. At this point, the anonymous stranger started shopping the device around to gadget blogs. Around April 12, 2010: Gizmodo acquires the purported iPhone 4G from the anonymous stranger. The gadget blog's parent company, Gawker Media, paid $5000 to acquire the device, according to the Associated Press . 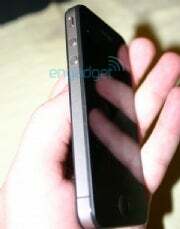 April 17, 2010: Engadget posts photographs of the purported iPhone 4G . The device is said to have a higher resolution screen than the current iPhone, a front-facing camera and 80GB of storage. Speculation runs wild in the tech blogosphere. Engadget did not elaborate on how the photos came into its possession. April 18, 2010: Onetime Macworld contributor and respected Apple journalist judges the photos as a hoax , but leaves open the possibility that this device is the real deal. A Macrumors commenter provides a photo of the purported iPhone 4G claiming the device is a knock-off widely available in Japan . The Macrumors photo is later discredited. April 18, 2010: Engadget posts an older, very blurry, photo that shows something similar to the purported iPhone 4G lying next to a pre-launch iPad , presumably at an Apple test lab. Later that day, Daring Fireball blogger John Gruber, who is known for his contacts within Apple, calls his sources and subsequently supports Engadget's claims that the iPhone 4G photos are authentic. April 19, 2010: Gizmodo reveals that it has the device and posts a detailed review of the purported iPhone 4G complete with pictures, videos and device specifications. The device had reportedly been running iPhone OS 4.0, but Gizmodo could not break the device out of its bricked state to confirm this. April 19, 2010: The tech blogosphere, already on fire over the iPhone 4G debate, explodes with stories and speculation about the veracity of Gizmodo's claims. April 19, 2010: Gizmodo describes in detail how the purported iPhone 4G was lost and identifies Powell as the person responsible for losing the device. April 19, 2010: Gizmodo posts a letter from Bruce Sewell , Apple's senior vice president and general counsel, to Gizmodo Editorial Director, Brian Lam stating that the purported iPhone 4G in Gizmodo's possession is Apple's property. The letter formally requests that Gizmodo return the device to Apple . Gizmodo uses the letter as final proof of the iPhone's authenticity, and returns the device to Apple. April 19, 2010: Satire over the iPhone debacle appears all over the Web. A Facebook fan page is started for Powell . The first Wall post reads, "just lost the iPhone 4G. S--t." The requisite video meme from the German production Downfall is also posted online showing Hitler getting upset over the loss of the iPhone 4G . The Future (based on pure fantasy): Gizmodo is banned permanently from all future Apple product launches. Apple sends a secret remote wipe code that bricks all Apple products owned by Gawker Media, its employees and anyone who comes within 100 yards of the company's headquarters. What do you say? Any other guesses about the fallout from Gizmodo's iPhone exclusive?